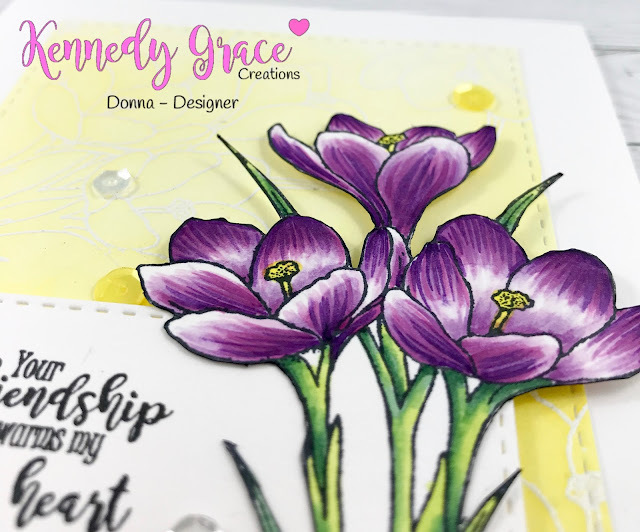 I really am loving this Friendship Blessings stamp set. I love the height on the flowers, and the beautiful clean lines. I have googled crocuses to colour my image. They seem to come in two main colours - yellow and purple. I absolutely loved the yellow crocuses, but when I looked in my stash of Copics, I had very little in the way of yellows, so I went with purple instead. I coloured the image with Copics, and rather than blending them as I usually do, I built up layers of colour using thin sweeps of the marker, leaving the striations visible, just as they are on the real flowers. I really love this look, and these flowers really showed if off well. 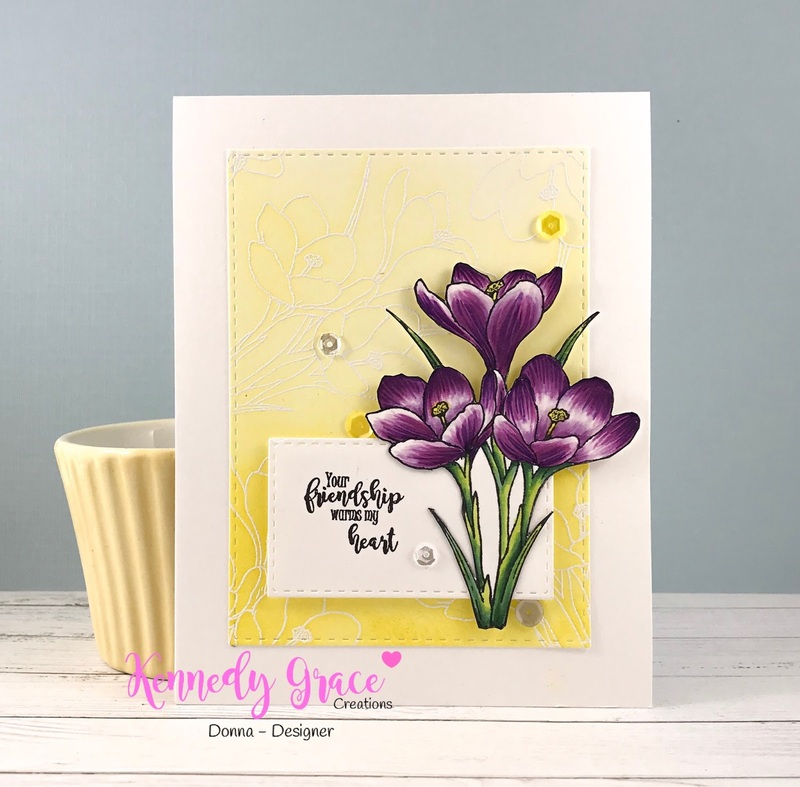 The background was created by stamping the same image on a piece of cardstock and heat embossing it in white. I then went over the paper in a yellow distress ink, putting more colour at the top and less at the bottom to give a subtle ombré look. The sentiment comes from the same Friendship Blessings stamp set. There are many lovely sayings in this set, and I find myself reaching for it a lot. Finally, to assemble the card, I cut stitched square panels for the background and sentiment. I fussy cut around the crocuses, but didn’t cut between the stems. That’s where the slightly larger sentiment panel comes in, allowing the white backgrounds to blend. After cutting the flowers, I drew around all the edges with a black marker to give a professional edge to the image. The final touch? 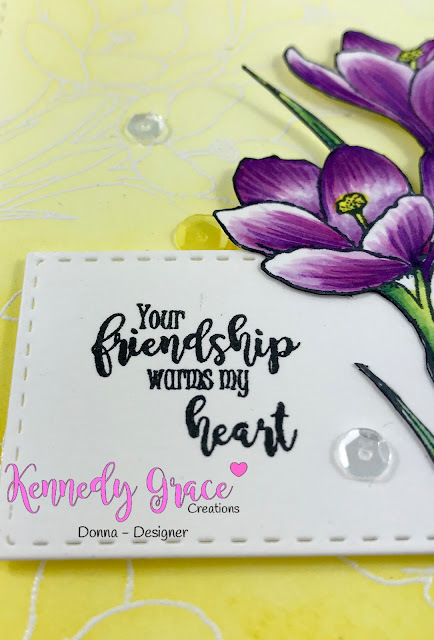 Some Kennedy Grace sequins! I used a lovely little mix called Lemon Sorbet just because you can never have too much sparkle! Until next time, may friendships warm your heart.